Modern information technology gives us extraordinary power, but the way we build the underlying hardware has barely changed over the past century. What if instead of continuing along a path of incremental developments we could completely upend the way we build tech? Michael J. Biercuk is a physicist working to harness the strangest rules of quantum mechanics as a resource powering a new generation of Quantum Technologies. 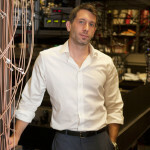 Michael’s research has been recognised with accolades including the Eureka Prize for Outstanding Young Researcher (2015), selection as one of the Sydney Morning Herald’s 100 Most influential people and award of the Australian Government’s [National Measurement Institute] NMI Prize for Excellence in Measurement Science. He was part of an international team whose work developing a new quantum-powered technology was described as the #8 “World-changing” experiment by BBC Focus. His team’s achievements have been featured in The Economist, The New York Times, Forbes, Wired, and a host of other major media outlets.